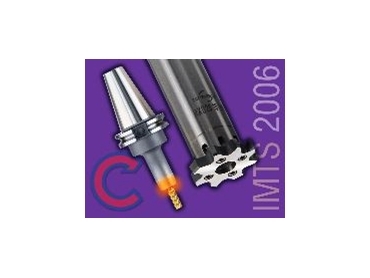 COMMAND Tooling System's new high-speed machining demo at IMTS 2006 will allow visitors to experience the difference between Thermolock holders vs. conventional toolholders, the benefits of balanceable boring heads, and the difference between single-point boring vs new reaming technology. In addition to the high-speed machining center, Command will also demonstrate four new heat-shrink tool changers and an expanded line of balancing machines. "With the industry's increasing demand for faster spindle speeds, the importance of precise balance dramatically impacts tool life, spindle performance and surface finish," vice president Robert Dunlap said. "Our goal is to bring the highest standards for balanced toolholders to our customers' operations because properly balanced tools improves the machine's overall performance." Command will exhibit its expanded line of ThermoLock holders, including fractional and metric, HSK, BT, CT and DIN in addition to the new 3-degree nose extensions. Also at IMTS 2006 Command will show its new URMA reamers featuring throwaway wafer technology which eliminates regrinding while minimizing setup time. Visitors will experience the difference in speed and surface finish between advanced reaming technology and single-point boring. URMA boring heads, from the versatile VersaMax to the one-pass rough and finish capability of the IntraMax to the micro-adjustable MicroMax, will be on display and used in demonstration. Command will also demonstrate four new heat-shrink tool changers including the "Mini Heat-Shrink" that allows entry-level users to experience Thermolock performance, and the new heat-shrink and pre-setter combination system. IMTS, the International Manufacturing Technology Show, is one of the largest industrial trade shows in the world. The event is held every two years in September at McCormick Place, Chicago.